Weather Channel nixes "Forecast Earth", including Cullen | Watts Up With That? Needless to say, I and many other current and former TV meteorologists took exception to the issue. I posted on it almost two years ago here. NBC Universal made the first of potentially several rounds of staffing cuts at The Weather Channel (TWC) on Wednesday, axing the entire staff of the “Forecast Earth” environmental program during the middle of NBC’s “Green Week”, as well as several on-camera meteorologists. The layoffs totaled about 10 percent of the workforce, and are the first major changes made since NBC completed its purchase of the venerable weather network in September. The timing of the Forecast Earth cancellation was ironic, since it came in the middle of NBC’s “Green is Universal” week, during which the network has been touting its environmental coverage across all of its platforms. Forecast Earth normally aired on weekends, but its presumed last episode was shown on a weekday due to the environmentally-oriented week. Forecast Earth was hosted by former CNN anchor Natalie Allen, with contributions from climate expert Heidi Cullen. It was the sole program on TWC that focused on global climate change, which raises the question of whether the station will still report on the subject. Cullen’s future role at the network is not known. November 21, 2008 in Announcements, media. Gee, I’m going to miss Heidi. Heidi who? Anthony, has TWC contacted you about filling in their credibility gap, now that Cullen’s hubris has been sent packing and the New & Improved Ice Age is just around the corner? Perhaps they’ll quit the propaganda areana and start presenting useful weather information and forecasts. And in this tough economy perhaps the greenies will discover that they’ll be the first to be let go. We can only hope. I’m hoping it includes Heidi. She’s earned it. I also won’t be surprised if there’s someone higher up who’s sweet on her and saves her. Perhaps this means they are going replace the group with some naturalists. I seriously think that TWC could really get some interest and make some money with a educationally oriented natural climate cycle program. They don’t need to focus on CO2 to have an extremely interesting program. Also, by being the 1st to change gears they would take any early ratings lead and add tremendous credibility. This is a no-brainer automatic winner for them and I won’t even ask for a commission fee. In this context, I believe it is time that we educate ourselves and the rest of the population as to what the definition of the word “Science” is. Lately it seems that we are confusing Science with Science Fiction (made-up-stuff) and Fantasy (wishful-thinking). The work Anthony has done has opened my eyes. In the case of climate records and such…specifically the Severonson Screen placement limitations as a RESULT of ‘certain’ improvements. It appears that they (GISS) had embraced a new and improved technology that has ultimately proved to produce less accurate results than the more primitive, old-fashioned technology. From what I have read here, this is a fact and GISS has admitted it as fact. It’s what happened next that annoys me most. Does GISS ditch the faulty data gathering technique and return to the more reliable technique? NOPE!!! Not a chance. In response, they start massaging the data, adjusting the data, re-reporting the data and even go so far as the alter the data compiled from the earlier and more accurate and reliable methods. This is mind-boggling to me. I believe that this is entering into the realm of Fantasy. Who am I? I am a know-nothing, nobody peasant of the realm. But what I do know is that I would PREFER to get my daily dose of Sci-Fi and Fantasy from the likes of Orsen Scott Card or Terry Goodkind… Not GISS, NASA et al. Thanks for the chance to rant-but who can we trust? What can we trust? Dave Schwartz? He was my favorite anchor. A sad day. As a private pilot I would tune into TWC to get the overall weather picture prior to calling in for a formal briefing. I was subsequently turned off by all the AGW propaganda. It’s really to bad too. Since I live in Southern California, where we don’t have real weather, when traveling I need the information. As Joe Friday used to say “just the facts mam”. Is that really too much to ask? Maybe now I’ll start watching the Weather Channel again. Heidi Cullen is gone. Long live the first ammenment. This is the fraud who wanted to have all TV meteorologist who didn’t profess allegiance to her version of the Global warming hoax have their AMS Seal Of Approval yanked. What goes around, comes around. Dr. Cullen, learn civility in the unemployment line. The real world is getting very tough and people have little patience for sanctamony. I’ll miss Dave Schwartz. When he got graveyard shift duty he was always a pleasure to watch. Not exactly a gentleman’s gentleman (he would on occasion say some racy stuff) but he always presented the weather with a style that was all his own. Now all the up and comers at TWC are a bunch of stiffs with no character. Who could ever forget all those priceless moments on TWC when Santa visited John Hope, a man that must be turning in the grave right now…. The weather on TWC was always fun to watch. Now if they’re not trying to scare you with global warming they’re playing endless drivel such as epic conditions, or when weather changed history or storm stories. That’s what ruined the weather channel. Just like MTV diverting away from music and involving themselves exclusively in pop/’urban’ culture. Why flaw a thriving business with distractions? The weather channel was just that. Weather. Now you’re lucky to even catch the weather while watching. I was watching that show with some interest until that little hallucination upon which I quickly turned the station. Absurd. Turnabout…an alarmist lost her job? Apparently Dennis Smith who anchored the very first segment on TWC when they premiered in 1982 was also let go, which was very sad to hear. Maybe with Heidi out of the picture, the Oakland Raiders might be able to score touchdowns; Heidi was their undoing. A very well respected British weatherman died recently, his name was Jack Scott. He didn’t engage in gimmicks, just did his homework and presented the results in a clear, informative and friendly manner. Forget hocus-pocus, forget being Nostradamus and always rely on the best possible evidence – observation. Kate, my thoughts are similar to yours. I used to avidly watch the Weather Channel until Heidi and “Forecast Earth” took over. It also seemed as if every time I wanted to see what was actually gong on with the weather, instead there would always be a special program on. Dave Schwartz is personable and entertaining. I seem to remember when some newbie (was it Eboni?) first started, she was on with Dave. The newbie was so nervous, but Dave seemed to be especially trying to put her at ease. Heidi Cullen Got Culled. Yay!!! PS. Normally I’m not happy when someone loses their job, but in this case I’ll make an exception. NBC didn’t buy TWC unless TWC could be a decent profit center. The downturn in the capital markets, increased unemployment, and a recession that will last at least another 12 months mean that every advertising dollar must count. AGW or Climate Change (as it has morphed into the last 24 months) is a loser as far as advertising revenues are concerned. Most people who periodically tune into TWC are not in the least bit interested in meteorology or the cat fights concerning Climate Science. The kind of contention that Heidi Cullen created a few years ago is a killer for ratings and advertising dollars. With the Internet and instant weather that can be relayed to one’s Internet devices, the TWC is under increasing competition. Such large scale lay-offs only mirror lost revenue that the TWC either has incurred or wil incur in the near future. The Alarmists have over played thier hand – both in academia and in the market of public opinion. The entire Green Movement does not automatically equate into revenue, as many like NBC are finding out. When one considers that much of the Green Agenda will be painful to many( mandates forced on an unsuspecting public), it could end up being a sure way to shut off revenue. Dr. Cullen, learn civility in the unemployment line. A switch to the anti-AGW side by TWC would generate huge controversy, and controversy is good for ratings. NBC shareholders would appreciate it. JP et al — I wouldn’t count on ‘fair and balanced’ programming from NBC. Leap not to wishful conclusions. Their track record is what it is. If there is a God, Heidi Cullen will end up giving blizzard warnings on some little tv station in Grand Forks or Duluth. Maybe the Weather Channel will become watchable again. Glad to see Heidi was shown the door. Too bad about Dave. He was one of the better ones. She got canned? Good. Couldn’t have happened to a more vile Luddite. [snip] If only someone at NASA would have the cajones to fire Hansen and then toss him to the wolves to be torn to shreds in litigous court battles. Come on George, seas rising 20 feet in two weeks, our children perishing in clouds of dust from global warming, but … Oakland Raiders scoring a touchdown? I have to draw the line somewhere between plausible scenarios and outright fantasies. Just tune in this Sunday and watch the game and see if the Raiders can score a touchdown. It’s a little sad to see the Raiders where they are today. In the old days the word was, “Here come the Raiders, lock up the women and children and hide the hubcaps”. Soon, we will feel the same way about the alarmist. If they don’t wreck the economy first. Except the economy has already been wrecked. With a bunch of people who had their own little computer models of derivatives and computer calculations of the value of all those junk loans and so forth. A little sense of irony here isn’t there? I really long for the days of the giant electronic brain. TWC was good when we didn’t all have ready access through the internet to real-time weather data like local radar. It became bad when it stopped doing weather and took on more of the MTV mode of not actually reporting on weather/providing music videos and more on global warming specials/Paris Hilton’s My New BFF. Two years ago, I wondered at my luck to discover this site; “I was not alone” I thought. Then it went quiet. Idly, I popped over today to discover it has become active again, for a month or so. It has Patrick Michaels contributing. Worth the time. Surprising as NBC is a sub of GE – major supplier of wind turbines – ie they have a stake in the green game. I really assumed when they bought TWC that was the whole play – as propaganda arm for their green businesses. Apparently not. Bravo NBC & GE! I am encouraged by this. I think this is telling. Here’s my interpretation : the average Joe could give a rat’s a** about “climate change” (ie the ratings sucked with current programming) – if they turn on TWC – they want a forecast & weather info. Period. I think it follows that although popular media makes it appear that everyone is on the green bandwagon, the reality is that most aren’t. This is good. Not that I am for trashing the planet – I am just for a reasonable dialog on costs & benefits. If the majority (this is still a democracy) believe the benefits are worth the cost (and of course assuming a legitimate & open debate of the science says there is any benefits at all, in the case of AGW), then that’s the way it goes. But, this whole shove it down your throat, no debate, ad hom attacks if you disagree with me, all politics, no science approach just doesn’t work for me – whether is AGW or any other scientific subject that the average Joe probably cant begin to comprehend. OK, got to say it, is it getting too cold to keep the hot hoax going? Does anybody even care about global warming anymore? When surveys are done, global warming doesn’t even twitch the meter. People seem to have figured out it’s just a tax scam, like the tobacco settlement was. Dr. Cullen still has her link with Climate Central, http://www.climatecentral.org/team.html . The site says “Look for our full site coming in 2009” so maybe she’ll be working more with them, whatever they are. If she did end up here, she’d be rethinking Global Warming pretty fast with a couple Winters under her belt. Local met said we’re about 4 weeks ahead of schedule for this weather we are having. December, and January are going to get rough around here. Yah, sure, you bet! Toivo, throw another log on the fire, ayy! Yah, to the Great White North, ayy. We already live there, ayy. Have they run out of money to publicise AGW or What? Don’t tell me that Al Gore has already spent his $300M of propaganda funds??? Bingo Jeff! In a nutshell…Also, Al gore won’t take an official role in The Obama administration. in theory, this would be perfect, with direct contact with the EPA circumvented by executive authority by Obama and immediate access for GOre. But then, hmm, what would be the hangup?..Oh yes , he would have to divulge his personal finaces and his participation in the green venture capital firm that just happened to be held by shearson Leaman and invlved swap credits. BTW I’m a formet Weather channel on air met. You should investigate what we call “The Penn State Mafia” and the connection to Sarbaines of maryland. 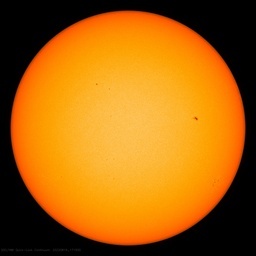 The sun remains blank for the fourth day in a row and solar activity will remain at very low levels. The month of November has a sunspot number average of 6.7. Although being small, this is the biggest average since March and consists of only Cycle 24 activity. The AOis negative and we have weak la Nina and low solar. Also a west QBO. The Northeast gets crushed by a three day noreaster next week, after being twenty degrees below normal this weekend. Then , arctic air returns and huge Greenland block inverts and noses down east of Hudson Bay. the entire east Coast becomes vulnerable to a December blizzard. I hope Obama is greeted by blowing and drifting snow, 10 degrees f with a howling northwest wind. I wrote an e-mail to the Weather Channel after the Heidi Cullen “if a meteorologist can’t speak to the fundamental science of climate change, then maybe the AMS shouldn’t give them a Seal of Approval” debacle. They never responded and so I stopped watching them on TV and visiting their website. I get my weather forecasts from the internet now anyway, so TWC is largely irrelevant. Plus, with Anthony and WUWT, who needs Forecast Earth??!! I got zinged a couple of times for quoting the Heidster last March. Good riddance to Heidi…wasn’t a Forecast Earth fan at all…. NBC is losing money because their audience is declining and I am sure their advertising dollars are falling so as a result TWC takes a hit. Their owner GE is also in trouble with poor leadership. I was turned off by Heidi’s droll delivery of balderdash and never watched again! I wonder if she’s hedging her AGW theology with heavy winter clothing and inspecting possible sled dogs for transportation. She wouldn’t dare purchase a polluting snowmobile. Think about it folks, Joe 6-pack sits on his recliner, his back sore from shoveling snow… and here’s Heidi yapping about the Earth boiling… up comes the remote and down go TWC ratings. Hey, Anthony. Another honorable mention for your scrapbook. Well, the US East seems to be in a cold spell, Western Europe is getting snow. In the flatlands of northern Germany we woke up this morning with 3 inches of snow…last time I recall a snow this early was 18 years ago. Seems like the table has turned on Ms Cullen. Looks like she’s been on the junk science band wagon, and not us sceptics. GOOD RIDDANCE to ideologue driven science! on the right side of the sun? Unfortunately, I don’t believe this action had much to do with people not tuning in for the ACC agenda, as it did with people just not tuning in, period. As many have posted, they just can’t compete with other sources that are delivered in an “on-demand” fashion, and tailored to a specific individual’s needs. This is the same battle printed media are facing. I’m always amazed when I hear a headline “Readership is down at the ____ Daily Times for the 3rd consecutive quarter!” Of course it’s down. How could it NOT be down, with more and more people turning to the convenience of other sources? The only reason left for people to tune into TWC is to witness first hand major storm damage. Without that……who cares? Is this a sign of the beginning of the end (of AGW alarmism)? Breakup the propaganda groups that inflame and and manipulate public opinion. Neutralizing the real profiteers, like Gore and Hansen, will be much more challenging. A good next step would be to do strong looks at why the GISS product is crap. It could be done as an expose on wasteful government spending. Another would be to explore how people who are selling ideas can easily manipulate numbers to rationalize to others why what they are selling should be bought. I see a sunspeck right on the equator. Look at the magnetogram at http://sohowww.nascom.nasa.gov/data/realtime/realtime-update.html then look at the Continuum image. How did the November count reach 6.7? Is that just from this speck or did our collective attention get distracted by the distractions this month? Yes!!! Thanks for the update Anthony. There is an equatorial speck that’s been sort of blinking on and off over the past 2-3 days since it first briefly appeared in the center of the SOHO continuum image. It’s now near the right side of the image. I’m surprised no one has noted it before. Must be all the recent real spots have turned folks off on noting specks. Also on the same SOHO image, there appears to be a “stuck pixel” at the upper right. I’m guessing that they’ve rotated the imaging equipment 180°, as that one seems to mirror an old SP that used to be in the lower left. Is GE exorcising the demons of Gore and Hansen? Is this a straw in the wind? Which way blows the wind? The comments on this post take in so many topics, I think this is not too far off. Even though the Polar Bears don’t have enough ice, seems the whales have too much. Assuming she is, in fact canned, perhaps she can use her now freed-up time to truly educate herself on the science of global warming, and then apologize profusely to her former viewers, and to any and all skeptical meteorologists and the scientific community in general. I ran across this post “The ENSO Driver”, http://climatechange1.wordpress.com/, today by Erl Happ. I would like to see some meteorologists critique what he has posted. I believe Erl is very close to figuring out a big piece of the climate puzzle. Ditched their entire environmental unit? Maybe the $300 milllion that Al Gore & his goons paid off the Main Stream Media with (including The Weather Channel) is running out, and the pipeline is temporarily dry. For sheer arrogance and contempt, heidi has few peers amongst warmers. With her “believe in global warming or lose your AMS seal,” outrage, she has to be right up there with those calling for war crimes trials for the unbelievers. Her future however is still bright, in government, in academia, and absolutely yes, on TV. How about another job within NBC, which just finished its latest “green week.” she could head NBC’s Ministry of Environmental Truth. Then there’s always Discovery’s new “green” channel, and of course al gore’s network. A wealth of possibilities for cardinal dr. cullen, and for us, there’s the OFF button. In particular, those interested in the anecdotal side of this, please come and tell us what’s happening with the weather, and climate (!) where you live. Thanks much! That is just revisionist history. The Heidi game was in 1968. Since then the Raiders have won three Super Bowls. They also smoked the Jets earlier this year and they’ve scored 10 touchdowns already in 2008. That’s tied for 31st in the league. I think Forecast Earth became superfluous. The message originally pushed by Heidi and friends has been adopted by NBC news, many NBC shows and the entire GE Corporate structure. There is no longer a need for Forecast Earth when the entire corporation is pushing the message. I hope they keep the Forecast Earth blog intact for the chuckles it provides. I have been reading lots of posts over there on new vehicle test drives and holiday cooking recipes (!!!???). What it has to do with the weather is a complete mystery. Yay! I couldn’t stand that ‘forecast earth’ series and ‘Dr. Heidi Cullen, climate expert’ made my teeth hurt. Dave Schwarz I like though. As long as they keep Jim Cantore I’m okay with it. Funny, a few years ago I was watching a news segment on women buying guns (don’t remember what network). They had a segment in a gun shop in Atlanta and who should walk in to buy a gun and say a couple of words? Cheryl Lemke! They did not identify her. Just the fact that she attacked anyone not subscribing to or doubting popular dogma proves her utter cluelessness with respect to scientific approach. Would someone please tell her that science doesn’t progress by agreeing with dogma -never daring to challenge it? It progresses by doing the very opposite. As one of my many responsiblities at a mid-Atlantic coastal Naval Air Station, I used TWC and it’s fairly accurate near-term forecasts to determine the number of plows I would have to use. Better than even our “in house” weather guessers. Unfortunately, they went the way of most news reporting programs and became infotainment. I haven’t viewed TWC in years becasue of the utter nonsense of people like Cullen. 200 ice trapped whales to get culled. Seems the arctic is freezing over a little too quickly in some spots. I think there is some truth to the notion that people are tired of being preached to about AGW, with all the guilt laid upon us for our sins of material consumption. At the same time, the surveys show that people believe that AGW is real and support doing “something” about it. I suspect that “something” is a vague wish and does not include government interventions in the price mechanism, taxes, and market manipulations, as favored and planned by Obama, especially under current economic conditions. The trouble is that the new administration’s plan will be pitched as something completely different than what it is — it will be sold as an economic “growth” package with “green jobs” and the like — and that this will be picked up and supported by the sympathetic, compliant media. How to counter this before it is too late? It seems clear that hammering on the facts and promoting an objective evaluation of the science is a losing strategy, not because it is wrong but because the facts are easily outgunned by key institutions now controlled by the left — the NGOs, political institutions, academia, professional societies, and the media. Even parts of the business sector have a stake in the institutionalization of AGW in the U.S. GE will sell more wind turbines, and a host of “start ups” are at the trough of government handouts in the form of subsidies and possible mandates. Rather than advocating doing nothing, the skeptical community should rally behind the idea of solutions based on new technology as an insurance policy against the possibility that something unexpected might occur due to continued CO2 loading of the atmosphere, while maintaining (correctly, I believe) that IPCC projections are wrong, their attribution of past warming to anthropogenic activities is wrong, and alarmist predictions are baseless. What technological solutions? Certainly lower cost alternative energy sources are needed. And taking the time to develop and deploy such future developments is highly favored relative to deploying current technology. Also, recent developments in air extraction and subsequent storage of CO2 show promise of a practical technology at costs that would be far less than draconian government interventions. Government should be providing incentives for the development and deployment of economical technologies, not mandating and subsidizing uneconomical ones. And most of all it should avoid economy-crippling energy taxes or “cap-and-trade” schemes. I for one find AccuWeather.com a preferred weather channel. Ms Cullen lost me when she came out with her outrages statement on meteorologists. Like her mentor, James Hansen, she refuses to debate atmospheric science. GW! Naww! Fresh Arctic air is spreading over the East coast states. Temperatures in northern Florida will be in the 20s. This weather pattern reminds me of the 70s when Florida had most of their orange crop frozen. If temperature drop further, they will be facing a repeat. Here’s a steaming cup of virtual cocoa (_)& for little Swiss Miss, to keep her warm inside while searching out that next gig. All I have to add is, it’s not Heidi Cullen’s global warming that’s hot. I must say that many of the folks here are in a total state of denial about the seriousness of the issue. TWC was helping to communicate science. Instead, here in the comments, I see a lot of folks clinging tightly to their dogma afraid of facts and science. It’s very sad and I feel very sorry for you. You’re children will hate your denial someday. A word of caution when comparing sunspot numbers: solarcycle24.com uses the ‘American Sunspot Number’ that is ~40% higher than the ‘Official Sunspot Number’ from Brussels. I use Google Earth for my local weather. I click on the weather option and look at the cloud formation. Knowing north winds are cold and south winds are warm, plus a degree in Pure Mathematics but more importantly looking out the window;. I can make my own weather forecasts. I am accurate, dare I say, over 90% of the time. Can I get a job with GISS? When local TV stations let people go, they usually try to purge all trace of them from their web site immediately. http://www.weather.com/tv/personalities/ may still be intact, at least it still has everyone listed as gone. 41 “Meteorologists & Personalities” and 4 “Experts”. I added an entry to http://climate.weather.com/blogs/ specifically the “Arctic climate drama” that appears to have been in July. I can see why the Forecast Earth crew was layoff fodder. I don’t know if anyone is there to approve posts. BTW, Forecast Earth airs at 1700 EST today, I’ll see if it’s replace or if they’re just running the shows in the can. You are of course kidding, right? For what it’s worth, Dave Schwartz was on the Weather Channel this Saturday afternoon with Christina Abernathy. Perhaps it’s an upcoming nonrenewal of contract, but he’s still there today. UAH Global temperatures are averaging a mere 0.0149 degrees above average for this year and three global temperatures metrics have show a ten year decline. To what science and facts are you clinging to? The Weather Channel … ha ha ha!!! Thanks for the laughs! I’ll miss you. Well in August we left warm hot sunny Scotland for South Florida. We were in lovely Naples and Faye came ashore at Marco Island. Next week it has Gustave. We watched the Weather Channel; which way was Gustave going? No no no it is going up the east coast of Florida heading for Georgia. No no no no it could go West towards Miami. Wrong maybe more SW towards Cuba and follow a similar track to Faye. Wrong again it will make land fall in Mexico. We then had Hannah which was going to make land fall in Spain. Ike was nothing to worry about just an un-organised tropical storm!! I thought BBC Weather was off the wall. Last week temperatures in “NE Scotland are WELL ABOVE average for the time of year”. We are on snow patrol tonight, roads closed, glaciers moving south! You sound very certain of yourself. Many here are also fairly certain and disagree with you. You need to be specific and as technical as you can if you want to try to sway others to your view. I would venture to guess that your view is developed because you trust the messages in the MSM and the various advertising campaigns. Further, I would guess that you are not ready to accept that what you are hearing may have been started by a group of advocates who latched onto CO2 as a good boogeyman and then after the initial proliferation, many others are now accepting of the story and in some sense, I don’t “blame” them. I guess that’s why my view is that the only way around this is to go back to the underlying science and to understand when empirical data is good and when it isn’t. That many prominent advocates can’t or don’t clearly address these questions should be a significant warning flag, even if an individual can’t follow the science. Also, don’t mix up skepticism of the magnitude of the role of CO2 with anything remotely resembling being against the environment. In fact i would say just the opposite because many, like me, think the Environment will be more damaged by an unnecessary focus on CO2, primarily because economies will be damaged and poor people don’t have much incentive to prevent degradation of the environment. Will, I have been following the discussions on this site for a while. I believe that most of the posters are keenly interested in the facts and science. It is refreshing to see so many people try and dig up the actual data, algorithms for computing models, and theories of climatologists. On other climate sites, I have found that people recite much dogma and echo each other without using logic and critical reasoning to see the facts and science. On this site, your opinion will be evaluated and respected if you offer evidence to support your claims. I must say that you are in a total state of denial about the seriousness of the issue. TWC was helping to communicate propaganda. Here in the comments, I see you clinging tightly to the dogma of climate change, afraid of facts and science. It’s very sad and I feel very sorry for you. You’re children will hate your denial of reality someday. That is simply hilarious, Will. By your way of thinking, then, Al Gore was “helping to communicate science” with his sci-fi flick Alarmist Hype, Propaganda and Convenient Lies? I see a lot of folks clinging tightly to their dogma afraid of facts and science. Looked in a mirror lately? Look closely. What is sad, Will, is seeing people like you who are so deluded about AGW, and who can’t or won’t be bothered thinking for themselves. Your children will despise your lack of fortitude, and lack of judgement and common sense for going along with, and helping perpetrate a fraud the likes of which the world has never seen, and which will cost untold billions of dollars spent needlessly and foolishly on a non-problem. We shouldn’t pick on Will. I do think he’s wrong. I would not object to the measures I suspect he would like to see enacted except that they will come at huge continuing expense and great cost in human life. And I don’t think they would help much at all, even if Will is right about the problem. I also doubt–very–much that the problem is immediate or that we are anywhere near a “tipping point”. First, we need to learn more. We know an awful lot more about climate than we did five years ago and a huge amount more than we did back in 1988 when the problem hit the political scene. We have certainly found that the historical records are badly if not fatally flawed and that the “hockey stick’ is simply out-and-out incorrect. What we need to find out is whether CO2 positive feedback loop theory is correct or incorrect. Recent evidence indicates it is incorrect, but we won’t be sure for a few years yet . Research and data ongoing. If it turns out to be incorrect, carbon caps are a de facto crime against humanity, and a very deadly one. CNN HLN tonight had a clip on the slow growth of artic ice causing issues for the polar bears. Stated slow re-growth of ice was a big part of the problem. Many of the people who are quick to point to the false intelligence that was used to support the invasion of Iraq do not allow for the strong probability that we have false climate intelligence to support measures that will surely cripple the world economy, especially the developing countries. In the first instance mainstream intelligence assessments from many countries agreed that Iraq was a major threat due to WMDs, funding of terrorist groups, etc. In this instance we have the a different international “mainstream” pitching us to buy into extreme action. The fortune lost will be much larger and the loss of life larger, though more hidden. And we will discover later that there was no reason for it. On the youtube video, Freeman Dyson, says that if we want to lower CO2, it is a trivial matter that can be done with the proper plantings and irrigation. Perhaps that is an approach that everyone could agree on. The older I get the more grateful I am of my father. He is now 90.
re: contact congress button. I am all for that unless it becomes a red vs blue, right vs wrong stereotype of what kind of person believes this or that side of the debate. Or worse, a broadside against the fact that the dems are in control of congress. That kind of message will be dismissed out of hand for what it is and we will be ignored. A cold snap in late November would traditionally herald the start of winter proper but this year has already proved an exception with snow covering parts of the south east of England, including London in late October. The freak snowfall on the night of October 28 has already been described by forecasters as the most outstanding example of early snowfall in the South East since 1880 and has seen some bookmakers slashing their odds on a white Christmas. Bookmakers William Hill have reported record betting levels already and have cut the odds on snow falling on Christmas Day in London from 8/1 to 6/1 and Glasgow is now as short as 7/2. Pamela, re your comment about a Contact-Congress button. Someone at WUWT would prepare the correspondence to be sent to the congresspersons. Each registered member of WUWT would receive an “action alert” email, including a button to access the contact-congress facility. The WUWT member could modify the correspondence with a limited number of new characters. The facility would allow the correspondence to be delivered by fax or email, at the user’s choice, to the appropriate congressperson(s) based on the registered user’s zip code. It would take $money to set up. It may be too expensive and too political for WUWT. What climate website would be appropriate for that? Someone at WUWT would prepare the correspondence to be sent to the congresspersons. Each registered member of WUWT would receive an “action alert” email, including a button to access the contact-congress facility. The WUWT member could modify the correspondence with a limited number of new characters. I hate me-too posts and postcard drives. OTOH, I send my congress critter a letter and get the same form answer back, so maybe the me-toos have the right idea. There a staff at WUWT that has time to “prepare the correspondence”? That’s probably news to Anthony. With the long term bitter cold being forecast by NCEP, will NOAA continue clinging to their global warming dogma, or will they start advising the country to take necessary action to protect the energy supplies this winter? We have arrived at a tipping point of sorts, where NOAA’s press department needs to decide if they are going to serve the function they are chartered with, or go down in flames. Same for the UK Met Office. Are they so deeply entrenched in their dogma that they can no longer see what is going on outside their windows? Has it been confirmed that Cullen was culled? If so, I’ll start watching TWC again. What that generation built was awesome. (Even more and better than the one immediately preceding it.) Whatever horizons we conquer it will be because we stood on the shoulders of those giants. I’m merely bringing up the concept of a climare-oriented contact congress facility to make good use of the information at WUWT. The facility may or may not be appropriate for WUWT, but would work elsewhere, or may already be in place, in which case, I’d like to know which website has it. Pamela Gray (17:04:30) wrote, “re: contact congress button. I am all for that unless ….” Even though you wrote that you don’t like “me-too” posts, this kind of communication with congress was extremely effective in preventing passage of the “Dream Act” three (3) times last year. It is used at both Numbers USA and Calif. for Population Stabilization. There is a wealth of good information at WUWT against AGW, and WUWT users would appreciate a convenient tool for putting that information to effective use vis-a-vis congress. I am not informed how large a staff runs WUWT. Is it just Anthony? Thank God. I wonder when the rest of them will figure out that these channels are invited into your living room, and that nobody invites a deaf-to-reason ideologue into their home more than once. Nov. 22 was the earliest sub-freezing day at Central Park since November of 1989. Newark Airport topped out at 34, which would be three degrees below normal for the middle of January. This is a remarkable turnaround, since the first two weeks of November, culminating in last Saturday’s max of 70, averaged 5+ degrees above normal. Virtually all of that deviation has been wiped out in six days! A modest ‘reprieve’ to a few degrees below normal next week, and then the barn doors with a northern exposure open wide for the first half of December. Looks like the freezing line runs right through my back yard! If November averages below normal for northern NJ, which seems likely, it will be the third month of the last four which has been below normal. I make no global or long-term claims for that factoid; I’m just keeping track. Now, if the forecast cold for December pans out, we might, in the extreme case, make a run at the all-time coldest twelfth month for northern NJ set in 1989. For those of you clinging to your denial and dogma. Here’s your facts & science. ps – hopefully the html works on this site & this comes out ok. If not sorry & i’ll re-post w/o code. Based on preliminary data, the globally averaged combined land and sea surface temperature was the second warmest on record for October and ninth warmest on record for the January-October year-to-date period. According to the National Snow and Ice Data Center, the October 2008 Northern Hemisphere sea ice extent, which is measured from passive microwave instruments onboard NOAA satellites, was the third least October sea ice extent on record, behind 2007 and 2006. Average ice extent during October 2008 was 8.4 million square kilometers, which is 9.5 percent below the 1979-2000 average. Sea ice extent for October has decreased at a rate of 5.4 percent per decade, since satellite records began in 1979. El Niño-Southern Oscillation (ENSO) conditions remained in a neutral phase during October. That is why they call it global warming. I guess posts here don’t accept html as my last commnt didn’t appear. So apologies if this is a re-post. Anyways, for those still clinging bitterly yo your dogma, here’s your facts and science. * According to the National Snow and Ice Data Center, the October 2008 Northern Hemisphere sea ice extent, which is measured from passive microwave instruments onboard NOAA satellites, was the third least October sea ice extent on record, behind 2007 and 2006. Average ice extent during October 2008 was 8.4 million square kilometers, which is 9.5 percent below the 1979-2000 average. Sea ice extent for October has decreased at a rate of 5.4 percent per decade, since satellite records began in 1979. * El Niño-Southern Oscillation (ENSO) conditions remained in a neutral phase during October. * The fast warming would likely begin early in the next decade — similar to the 2007 prediction by the Hadley Center in Science (see “Climate Forecast: Hot — and then Very Hot“). We are clinging to denial and dogma? Those who quote Hadley, NOAA, NCDC and NASA as their sources might want to do a little investigation behind the scenes to see how they ‘derive’ their numbers and predictions. These organisations are the kings of dogma. Thanks for followup. Folks had asked me to supply specific facts to back up my assertions which I have done. So if you have a problem with the scientific data as presented, than by all means please provide specifics that refute the above data. Just remember that IPCC findings represent the validation of 1,000’s of scientists and has been peer reviewed. Your specific refuting data should also have similar sources and peer review. GISS had used the previous months data. I would call it global goof. Mr. Small proved he knows very little about his subject. Know one with knowledge would write “peer-reviewed scientific literature has a couple of interesting forecasts for the next decade” and expect anyone to be impressed. First, “peer-reviewed”? I think I’d rather have some science that someone had actually bothered to check. Second, scientific “forecasts for the next decade”? Would these “scientific forecasts” be of a quality equal to Dr. Hansen’s erroneous forecasts? Peer-reviewed scientific forecasts — What a joke! Make that “no” one. Lol! How are you going to react when all your agruments are blown to bits? Don’t make me laugh too much about peer review! I never said I was a scientist. Just a concerned citizen who cares about the planet. Yes, I’m a liberal tree hugger, too. Sorry, those are the facts from the U.S. Gov’t. Just how does one validate a scientist? Your grammar seems to be as shaky as your science. Also having both done some peer-reviewing myself, and having published a number of peer-reviewed papers, I am probably less inclined to be impressed by the ritual incantation of the phrase “peer review” than you are. What do you suppose the HadCRUT3 data for the entire year will show? And how’s Hansen’s Scenario B doing these days? Here’s what an independent agency says about climate forecasting computer models. •	Out of the 140 forecasting principles, 127 principles are relevant to the procedures used to arrive at the climate projections in the IPCC report. •	Of these 127, the methods described in the report violated 60 principles. •	An additional 12 forecasting principles appear to be violated, and there is insufficient information in the report to assess the use of 38. As a result of these violations of forecasting principles, the forecasts in the IPCC report are invalid. You know you guys, I don’t really see anyone refuting the scientific facts here. I see folks griping about my grammar, spelling and how I’m not a scientist and other red herrings. As for HadCRUT3 data? It’ll show increase in temperatures for 2008. The 8 warmest years in the 150 global temperature record are, according to the Hadley Center, in order, 1998, 2005, 2003, 2002, 2004, 2006, and 2007 – those are also the 8 warmest years in the NASA record, in a different order, starting with 2005, then 2007 tied with 1998). Where the heck is the cooling trend? Same for Hansen’s Scenario B. As usual, if you can’t win on facts, destroy the credibility of the poster. It’s this conservative, rigid mindset that doesn’t allow you to see new ways of thinking. Try and open your mind and be progressive. Be part of the solution and not part of the problem. You guys probably work for Exxxon, drive Hummers and have a vested interest in the status quo. Sorry, those are the facts adjusted numbers from the U.S. Gov’t. I’m perfectly happy to look at the data. Maybe you ought to do the same. Here, take a good hard look at this table. I am pleased that a fellow tree hugger has posted on this column! Hear, hear!, and keep up the good work! I agree with you, that our fellow bloggers should not attack you based on your grammar skills or lack of science education, but instead with facts. I also don’t write so good, and make plenty of mistakes anyhow. What the skeptics here are trying to do is direct you to places where you can learn about the science behind the AGW and greenhouse effect. Please don’t take their harsh language personally; it comes from the exasperated feeling you get when you try to explain something logical to a person and they refuse to consider it based on their prior impressions. In other words, their patience is wearing a bit thin. I am very concerned with the environment and how we can best protect it, just like you. It is very important to get a good basic understanding of the history of our climate and a few general principles about global warming and cooling. Where to go to get this information? Try sources that are not directly involved with government, or are not dependent on grant money to show a certain position. “Frozen Earth” by Doug McDougall is a history of how geologists found out about the ice ages. It explains a lot, and is critical for anyone interested in global warming. Also, it is simple enough that even I could understand it! Junkscience.com is a good venue for finding out alternative theories and scientific logic that is counter to the positions popularized by Al Gore. If you read enough of the threads on this website you will also discover a dearth of clever people trying to solve some of the problems from a variety of angles. Good luck with your enlightenment! I am looking forward to hearing more from you on this topic. I would like to see all weather (people) be held liable for any and all pontificating from such positions of power. I am a licensed professional and as such, I am liable for anything I say or do. Or we could just wait for the Ice Age – or whatever actually happens while all the scientists are being distracted from actual science by AGW movement. It’s already started. Joe D’Aleo found that global temperatures track major circulation patterns than CO2, see http://wattsupwiththat.com/2008/01/25/warming-trend-pdo-and-solar-correlate-better-than-co2/ . The Pacific Decadal Oscillation flipped negative a couple years ago. When it flipped positive in the late 1970s that ushered in 30 years of warming. We expect that the negative PDO will bring 30 years of cooling. Not quite as strong – the last couple of PDO cycles show a gradual increase, presumably part of the recovery from the Little Ice Age. Eight years of warming, two years of cooling, come back in another six years. Umm, the sense I get here is that no one believes the Met’s forecasts. That myths site looks awfully close minded. At least here you a can argue your case. I think we are – the “CO2 is the problem” dogma is blindly accepted by thousands of people like you. Joe’s correlations are really interesting, CO2 over geologic scale time is really interesting, the quality of the ground based data is astonishingly scary. Are you aware that Anthony started surfacestations.org as a grass roots project to document siting quality of the US climate network? One spin-off is to distrust ground based observations like GISS and HadCrut in favor of satellite based data like UAH. If you’d like to start a site audit in the UK let Anthony know. No, I work for a software company and drive a 1999 Saturn SL2 with 227,000 miles on it. Yeah, too long commute, but it gets over 30 mpg, even with 10% Ethanol gas. I did buy it as a low cost, high mileage freeway car. It’s held up better than its predecessor, a Saab 900. See http://wermenh.com/saturn.html for what happened to my first Saturn. Thanks for the supportive comments from Old Coach. I’ll be the first to admit that I can’t go head to head with most of you on every piece of data. I stumbled into here because of TWC canceling FE. I mean a single program broadcast once a week in a poor timeslot on something that many, many scientists and non-scientist believe is happening with GW? I don’t think many of us who believe we’ve passed a catastrophic tipping point are being too paranoid when a giant corporation like GE takes it’s first action on this front. Now we’re at the stage that GW denial no longer works so now Big Media just suppresses the info and hopes it goes away. If anyone can prove that TWC acted purely on ratings issues, I’d love to see it. Because from what I understand, Cullen had very high favorability ratings and solid credentials. With this statement you disqualified anything that you might have said elsewhere . This statement is characteristic of a crackpot , antiscientific , conspiration theory which is precisely the reason why no sane person will listen to whatever you might want to say . I can say with on certainty bordering probability that nobody here is working for Exxon . However as people generally work for somebody (who are you working for ?) , discriminating people by the company they are working for is typical of a fascist mindset that is unacceptable in most civilised countries . As for the Hummer , I am also convinced that nobody here is driving a Hummer because it is a bit too expensive even if it is a fine and comfortable car . However buying and driving a [insert your favorite care model] is as legal as buying a Hamburger or using air conditionning . If you consider that YOU have the right to prescribe and enforce the way Chinese or Europeans must live and what cars they should drive , then you are deluded because only an infinitesimal minority of mankind dreams of an Orwellian society . But as I am a scientist back to science . By your own words you are not a scientist . Bad luck because , unfortunately for you , atmospheric physics can’t be understood and discussed without a fair deal of physics and mathematics . From my experience with talking with non scientists about physics , they tend to misunderstand and to misinterpret most of the basic facts . It is not surprising but it takes many years and hard work to catch up for those who wish to achieve a kind of understanding . If you want to do so , below is a list of results that have to be understood . – The IPCC prediction based on a non stationnary stochastic model for the 21st century is a GMT central tendency of 0,2 °C / decade . Consideration of data between 2000 and 2008 with an AR(1) model FALSIFIES this prediction with a 95 % confidence . – Peer reviewed papers (like f.ex Dr Koutsoyiannis) prove that the hypothesis of non stationnarity is not relevant for climatic processes . The scaling hypothesis is a better alternative to interpret the data . – Radiative transfer models that are used for GCMs , treat radiation uncoupled from convection . This is obviously wrong for systems where convection matters , the Earth being an example . There doesn’t exist any model coupling both and many scientists consider that this problem will not be solved in any foreseeable future . – the short term atmospheric dynamics are a chaotic process and this has been known for almost 50 years . There doesn’t exist any derivation proving that time averages of dynamic parameters obey stochastical laws . Indeed in all deterministic and chaotic systems they don’t . That’s btw why there can’t be a theoretical derivation of the climate sensibility and numerical models must be used . Peer reviewed papers (Ruelle , Takens etc) prove that in many cases fluid flows present a chaotic attractor . This is a HUGE unsolved problem for the climate predictability . – the single most important parameter for the albedo at scales where Earth’s orbital variations can be neglected (up to some thousands of years) is the cloudiness . So it is the cloudiness and the thermal inertia of the oceans that are the primary driver of the system’s evolution at intermediate time scales . The climate models are known for not being able to model cloudiness because the physical processes are simply unknown to this date (see on this theme peer reviewed papers by Prof Lindzen) . On top the clouds are spatial chaotic structures what doesn’t make the problem easier . 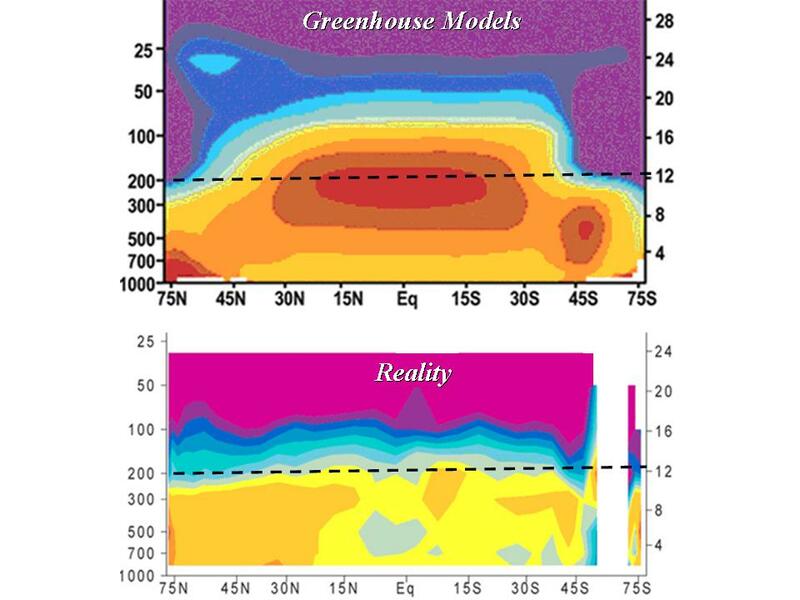 Therefore the models get the dynamics of albedo hopelessly wrong as well as regional humidity&temperature predictions (see peer reviewed papers by R.Pielke) . So now I’d suggest you to stop writing on blogs and dedicate the next few years to some physics to understand what is said above and why it is important . Shorter Tom Vonk: The models are inadequate for what they claim to do. Believe them at your peril. Whatever happened to “Up for the challenge?” and “Bring it on”? Which catastrophic tipping point do you think we’ve passed? When I get some time I’d like to write a web listing the tipping points people have suggested and provide links supporting and doubting claims. I will not be as scientific as TomVonk, but I am also a scientist, retired particle physicist in Greece, and my pension, on the small side, is adequate to self finance my late interest in climate science. If a governmental panel came up with a report that said: “the sun will be rising half an hour sooner every day”, would you believe the report? Would you check the time the sun comes up? The latter is the skeptics method. We were given a report that says it is warming, and also in 800 pages gives various “scenaria” of how the video scape of earth will be in the future. Us skeptics are checking on the time the sun comes out, and we have seen that the projections and expectations of this voluminous AR4 report are falsified on at least 4 points. Mind you, even one point wrong discards a theory. The tropical troposphere is not heating up as the IPCC claims. The truth is, nature does not follow the GCM IPCC models. sorry, you have to copy and paste the link, I cannot make a short link here. Thus, imo, all this AGW business is a production set up to stampede the masses into supporting destructive policies they would never consider otherwise. So us skeptics have checked the data, and the claims of the IPCC reports are bogus. The models have to go back to the drawing board. How to stop the stampede is the question before irreparable harm to humanity occurs. Humans, like all mamals, are prone to stampedes. I would lay dollars to donuts that you can’t go head to head with most of us on any piece of data. I bet that you can make wonderous rhetorical arguments for coming catastrophe. I am betting that you were won over by rhetoric, and so can only defend your position by rhetoric. In other words, you have an English major’s deep understanding of science. Since you weren’t reasoned into your position in the first place, it is also plain that you cannot be reasoned out of it. Prove me wrong, please. Slap us down with superior argument! OK, I am guilty of not reading the whole thread before making that last comment. Small does seem capable of regurgitating dogma fed to him by others, he does not seem, however to be able to critically assess it or to be able to critically asses counter argument. Warmest October on Record? The fact that he would use that laugher around here just shows how limited his reading on the subject is. In other words, don’t read anything with which you disagree. Hurts your head, I’m sure. TWC is an invited guest in people’s homes. Who wants to invite that harpy ideologue Cullen back into their home? Not me, certainly. The GW propaganda was also slipped into regular programming to the point where I no longer watched the channel. I don’t think it is necessary to grasp these complex topics before an understanding of the situation is gained. Off topic, but I would guess that many of the authors of these papers can’t get a good grasp of entropy and the enormous impact it has on driving heat transfer. I think it is counterproductive to infer that someone is too ignorant of the science to participate in these discussions. In fact, some of the concepts are quite simple. If we want to model the future climate, we write an elaborate computer program that makes forcasts if we put in all the correct data (current temperatures, pressures, solar radiation, etc…). Testing this model is straight forward. We pick a time in the past when we know what the weather is. Then we back up 50 years or so and put in the data from that time. Does our climate model program spit out the correct temperature for 50 years ago based on the data from 100 years ago? No. So, we change a few coefficients and try again. Eventually our computer program correctly spits out the temperature for 1950 based on 1900. Then we try another temp; say, 1970. We put in the data for 1900 and see if it can predict the 1970 temp. Does it? No. So, we just fiddle with a few more coefficients and equations until it works. As of today, there are no climate models that have been created to properly model even the past climate events. They are all faulty. They don’t work. It is a simple concept. The guys writing those computer models are quite brilliant, and very good at what they do. However, the models don’t work. None of them. Climate is just too tricky. They can’t predict past trends, much less future trends. Also, any large purturbations, such as volcanoes and local cooling or warming events causes the models to go haywire. The climate does not follow the models. This is just one example of something that you don’t have to be a physicist or engineer to puzzle through. It would help all of us if more of the non-technical crowd would become educated in these matters, so please don’t scare them away! Maybe you were trying to educate Mr. Small, but the impression I got from reading your post was that you were trying to intimidate him. If I am mistaken, then I apologize. I believe that there are simpler sources to defend your position. I am a Volleyball coach and I drive a 1992 Probe with 140,000 miles on it. I used to really like the Weather Channel, but for years now they have been too busy with crap like when weather changed history or the AGW gloom of the week. Stuff that it is completely useless and uninteresting. When are they going to figure out that the morons out there are not their audience and lay off the pseudo science 2nd grade crap? As for AGW I really need someone to explain to me how warming would be bad? I am absolutely freezing much of the year, and this year the growing season was VERY short. Why is lake property on a little fake lake like Havasu worth so much more than my property on Lake Baikal? Baikal is a lot nicer in many ways. Heck, my old house on Lake Huron doesn’t even command much of a price. People, plants animals like carbon dioxide and a little warmer than what We have. Too bad the CO2 doesn’t appear to have much if any impact on warming. You apparently have just stumbled in here and are new. The things you think are scientific “Facts” because someone said so, and “everyone knows” are in fact the things which are being debated. Many of the posters here have far more background than I do and I have a BS in Chemistry and Physics and the course work for 3 related masters degrees. In addition I have followed the issue for over 20 years working with it indirectly. The more an honest person understands about the assumptions that are built into the entire idea of human caused Global Warming the less they are likely to believe it. During our current ice age, geologists are able to get pretty good pictures of certain things based on ocean floor sediments, ice core samples, and fossil records. During this ice age, there are periods of glaciation and inter glaciation. We are currently in the latter. During the colder time periods, the world becomes windier, stormier, and drier. (storms here are storm systems). This is shown by the amount and composition of dust in the ice and the water content of the ice, shapes of ice crystals, composition of silts, and composition of fossils. Very clever, those geologists. So, during our current ice age, when the temperature drops, storm systems become more intense (increased temperature gradient between the tropics and the poles), the climate dries, and the earth becomes windy. The total biomass supported on land decreases dramatically. Before our current ice age, temperatures were mild, rainfall was plentiful, and land masses were able to sustain a higher biomass than even the warm periods of our interglacial maximums. Thus, colder is better and warmer is dangerous. See, humans would never have been able to evolve and advance without the enourmous pressure to survive that the current ice age has caused. This is one of the primary driving forces for evolution of species. With warm, mild weather favorable for more land based life, humans will get lazy. In the past, if food was easy access, then humans would not have needed to advance in order to survive, and we would still live in trees. We need a little hardship to help get us back on track, and toughen us up. Bring on the cold. Perhaps Mr. Small could explain why surface station data is diverging from satellite data particularly for the last ten years. According to UAH, October 2008 ranks 10th warmest since 1979. October 2008 ranks second coolest since 1998, and the coldest since 2001. Yet, haven’t we been told not to place much confidence in one month’s worth of data? Or one year for that matter? Will Small, as the earth fails to warm and falsifies IPCC guesses, you and others like you will get more desperate. Hopefully by then the public will see through the facade. Just a coincidence or is this more evidence that sanity might actually prevail? Does anybody esle wonder if the recent cooling is due to the increase in pirates we have all been reading about? First, apologies for some of my etiquette breaches on this blog. Yes, I’m a bit emotional about this topic which I realize is totally un-scientific. Be that as it may, I appreciate everyone’s help in dissuading me from my delusion that GW is a really serious issue that we need to act on to prevent catastrophe. And to be really straightforward, as I mentioned earlier, I stumbled here on the GE/TWC/FE post. I think the fella that runs CP makes science understandable for non-scientist folks like myself. The other part of my posting here is not to incite but to learn where your mindset is coming from. I realize the Exxon line may have been out of line but here’s the point. If you work for exxon you have a very vested interest in the outcome of this debate. My self interest? Sure, i’m trying to save the planet. Laugh if you will, but I’m not trying to make a buck or keep my job. In fact, my position on the issue actually puts me at economic risk. But anyways, from what I understand is that this whole GW debate has been going on because “the science isn’t settled”. Well, when is the science ever settled? When it’s too late? Because if that’s what it takes, then I think science is doing a dis-service to mankind. Afterall, what’s the downside if GW is a fraud? We would have cleaner air & water by reducing coal power. We would have alternative fuels and be energy independent. It seems like there’s a lot of upside on this, is there not? Much more so than the downside. Someone said, so what if it gets hotter? I think folks here must know what that means on many levels besides just submerged beach front property. But I’ll say that this is a learning experience just being here and talking with you. Sort of like a Democrat at the Republican convention. Our side is won over on the facts as we know them. At this time, folks such as myself need to better understand what it will take to win you over. So I’ll conclude by saying, what would it take to convince you that GW or AGW is real? What is the one absolute irrevocable fact that would convince you that we need to act to prevent total disaster? The fact that CO2 is an essential plant fertilizer is often over-looked by many of the “greens.” It is a limiting reactant that plants are literally starving for. While no good scientific study has been conducted, best estimates I have seen are that food production has been enhanced by 15% with the increase in CO2. Thus, if you want to grow enough food on this planet to feed 6+ billion people, we need all the CO2 we can get. BTW – greenhouse growers increase the CO2 present in their production of vegetables. Also, as was stated earlier, ALL computer models rely on CO2 having this positive feedback built in to their programs. Current data and evidence from satellites does NOT support this. Finally, does it actually feel warmer this year than any say twenty years ago? Our spring and winters are still starting and stopping on about the same time they always have. If we were truly warming, then you would see much longer growing seasons in the temperate zones. Please read the brief and non scientific explanation offered in the post above concerning the effects of raising temperatures. If you want a consensus, the geological community is very confident that warming, even dramatic warming, has always meant better weather for the world. First, Proof (or logical near-proof) that global warming will be bad. Keep in mind that this proof will go against all the current science and all the known history of earth’s climate for the last 4 billion years. Before that, it is still a little sketchy. Please note that proof is not “This guys computer model shows that warming = doom”. Proof would be showing how when the earth warms, bad things happen. The earth has been much warmer than it is now (infact, it is warmer much more often than colder, but we are currently in an ice age). So, it should be easy to prove this if the data is out there (but it is not). Second, Proof that adding CO2 to the atmosphere warms the planet significantly. This will be a much harder proof, as it will have to be more scientific and the topic is much more complicated. I have an open mind. If our current understanding of geology and paleo-climatology is wrong, and if the experts in CO2 spectroscopy are wrong, and if the engineering and physics community do not understand thermodynamics and cause-effect relationships, then your position may well be valid. Answer: That human emissions of CO2 drive the climate. Prove that and you’ll have a lot of followers. So far we’ve only seen a few anecdotes. And history shows a very poor correlation between atmospheric CO2 concentrations and global temps. And there is a real danger in being wrong. The slightly cleaner air will come at a huge cost in terms of prosperity for poor countries, freedom, government interference and world resources being shifted from solving urgent problems like hunger, disease, poverty etc. to solving a problem that does not really exist. Millions will die. Look at the biofuel farce, as one single example. Yes. It means millions starving and millions dead. Cap and trade will keep those uppity third world counties in their place, totaly undeveloped with rich from selling carbon credits dictators. This is what the AGW crowd is glossing over and ignoring. So I too want to save the world, from the sure catastrophy of cap and trade programs. As I said, total disaster would be the implementation of these stupid programs of stopping CO2, and innocuous minor greenhouse gas that is vital for life. Did you know that if the level of CO2 falls below 150ppm plants die? Did you know that plants thrive with 1000ppm in true green houses? Did you know that the alveoli in your lungs carry such large numbers of CO2 in order for oxygen exchange to work? Up to last November I was not paying attention and believed the AGW stuff, trusting in the scientific integrity of other scientists. Until the hockey stick debacle made me look up, and see that not all scientists have integrity, and start delving in the AR4 reports. All 800 pages of the “physics” justifications. To reply to your question: Correct science. The AGW science is a farce. And BTW, I am all for alternative energy and conserving the oil we have for future generations, it is useful for a lot of stuff other than making CO2. But this can be pursued at a logical pace without destroying western civilization as we know it and further destroying the third world. In 50 years plentiful clean energy from fusion will be available and the burning of oil will be a non issue. and if you honestly look at the approach used by AIT, and Hansen, etc., you really got to wonder. I mean some of their claims are really off the wall, or proven to be just plain phoney. Will, the question you pose at the end isn’t answerable with just one datum point. The fact that we’re talking about systems should make that pretty clear. I can only answer your question with one of my own- what convinced you that AGW is in fact actually occuring for the reasons as stated (driven by CO2)? I appreciate the toned down rhetoric. But, of course, there is no easy answer. As I’ve pointed out before, I happen to believe GW and AGW are real. It’s the catastrophic part I question, and the single-minded pursuit of CO2 as the villain. Imagine if someone had asked in 1908, “what would convince you that automobiles will not destroy mankind by the year 2000.” It’s also as if I were to ask you “What is the one absolute irrevocable fact that would convice you that our climate is not headed to a state of disaster”? But I will tell you what would give me pause. Despite our previous exchange, I’m not sure you actually know what “Hansen’s Scenario B” is. In 2005, Hansen published this chart as an update to his famous projections in 1988. At the time (2005), observed temperatures (he uses land-only for some reason) were just about the same as “Scenario B”, which we’re now told are the forcings that have actually happened. 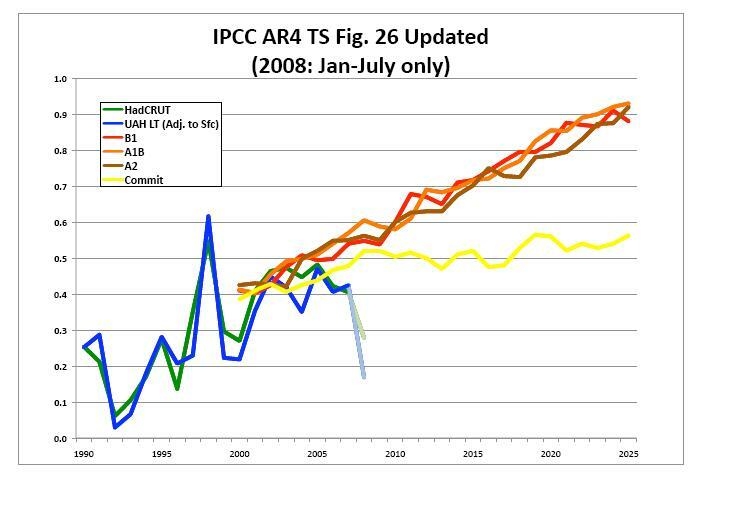 Despite the fact that the observed temps were also very close to “Scenario C”, which assumed draconian cuts in GHG emissions in 2000, there was a lot of back-slapping and high fives in the AGW community about Hansen’s “vindication.” Guess what, the asterisks in the graph I’ve linked to represent data since 2005. In fact, as I’ve pointed out recently elsewhere on this blog, 2008 will come in somewhere around an anomaly of 0.5K. So after all that, if in ~5 years, the observed anomaly curve is back up to Scenario B, I might start believing climate scientists are doing more than just over-fitting a short term trend. What about you? If observed temperatures continue to lag far behind Scenario B, are you willing to change your opinion? I think everybody reading here would agree with cleaner air and water. Thing is a modern coal plant produces very little pollution if you do not count CO2, and other forms of fuel like natural gas produce no pollution. Most(though not all) fuels do not pollute water. Then consider Bio fuels cause huge pollution, energy saving light bulbs contain mercury, wind power has a huge physical footprint, tidal barriers and dams destroy habitat. I will not attempt to list the environmental problems of the world but if i made the list then climate change would be just one on the list. All the money is going to this one issue so if it is not as serious as some think then its a waste of money. Mandating renewable energy by law takes resources from the most effective technology to the one which is politically popular eg corn ethanol. Also it makes energy more expensive which hurts the poor the most. Governments could make much more effective energy policies (including renewables) if you forget about CO2. Since all of civilizaton has occured during the current interglacial, and it had its first origin and flowering during a period warmer than the present, that explanation simply doesn’t wash. In fact major advances tend to correlate somewhat with warmer periods. darn good tongue in cheek try though. My language was not specific enough, I am afraid. I was not talking about the advances of HUMANS, but the advancement of species. Before the pre-cambrian explosion, life on the planet was nothing but Archaebacteria. Then, there was an episode that looks like it may have been a “snowball Earth” event. Very shortly after (and maybe during the later stages) of this event, the biosphere exploded with diversity, and the multicellular buggers swimming in the ocean had the genes for all phyla. Amazing! In between ice ages, the reptiles flourished. Our biosphere became locked into a system with dinosaurs as the predominant animal land walkers. It took a Climate disaster to reset the populations so that mammals could emerge. In the middle of the last glaciation, the climate was so harsh (and perhaps exacerbated by the eruption of the Toba Caldera), geneticists tell us that perhaps as few as 33 fertile females were extant on the planet! Fascinating! I just wish I could remember enough about genetics to know how they arrived at this number… Anyway, it is weird sometimes to think that if it were not for the ice ages, life might still be a soup of archaebacteria. In short, Wondering Aloud, I was not talking about civilization advances, but evolutionary advances of our species, but I was not very clear with my rambling! Well, the way NBC was during the elections, they might just turn The Weather Channel into the all Obama Weather Channel and do constant updates of the weather conditions around him. ah, the good ole days before Man screwed it all up. Me again. This is all very fascinating these insights into everyone’s thinking. It is helping to understand better your side of the argument which is why I’ve come back a few times. We still seem to be worlds apart so I appreciate everyone’s patience. I think I came in here somewhat angry by the commenters at the top being all snarky about the prospects of unemployment for Dr. Cullen. It seemed that some were down right cruel to her and dismissive of her views. It smacked of arrogance and lacking empathy. But I can’t engage all of you on all of your points. This is kinda like getting mugged in a dark alley. But I’ll go after a few comments. Anna says: Did you know that plants thrive with 1000ppm CO2 in true green houses? No, I didn’t. OK, so what about other life forms like humans and polar bears? I don’t think they do so well @ 1000ppm. I see lots of concern about impacts on 3rd world countries brought on by cap & trade. So what are your suggestions for helping the 3rd world countries improve quality of life? Maybe the US should increase foreign aid to these countries to make them more self sufficient? Another perspective might be if we have environmental havoc, economic conditions are somewhat irrelevant as the world descends into chaos, starvation, etc. And back to the last question about what is the one absolute irrevocable fact that would convince you that we need to act to prevent total disaster brought on by GW or AGW? I think I saw some hedging on the answer. It’s not one fact but a set of facts. Mongo turned the tables on me with what fact convinced me this was a concern and real? Likewise John didn’t answer the question either with “Imagine if someone had asked in 1908, “what would convince you that automobiles will not destroy mankind by the year 2000.” It’s also as if I were to ask you “What is the one absolute irrevocable fact that would convice you that our climate is not headed to a state of disaster”? Now I like to think that I’m a reasonable guy but that is really condescending when I was trying to debate with you since that was what everyone got all stirred up about. But here’s another question maybe you folks can help me understand. Everyday, we burn tons & tons of coal, oil, & gas. That generates heat that must go somewhere and have an impact, no? And we cut down forests by the square mile on a daily basis. And so on. Don’t these actions have consequences for the Earth? Are they sustainable behaviors? Are we saying that just because we don’t know the exact consequences of these behaviors with scientific precision that we should carry on until the data arrives that says “oops, maybe that wasn’t such a good idea to burn and cut down everything.”? Please read the theory and think about it. Again an independent sutdy about the bears. Burning Coal, Gas, Oil, Nuclear, gasoline, glucose (what life burns) all create heat, and add it either directly or indirectly to the environment. It does have a local effect on the immediate environment. The overall effect on the climate is still unknown, but almost certainly negligible. Vastly more heat is being generated by life forms burning C6H12O6 (sugar) and converting it into CO2 and H2O, the two main greenhouse gases, than is being generated by power plants and cars. As I am an eco-green freak, I can’t stand it that we keep cutting down forests. I have not read any posts to the contrary on this site or I would be sorely disappointed. I think most here are upset that more of our resources are not going to protect forests, oceans, and particularly water supplies (rivers, lakes, etc.). I can’t speak for everyone here, but it makes me sick to my stomach when I see 500 year old fir trees cut down for lumber. A lot of progress is being made here, but it still makes me upset. How would humans and polar bears like 1000 ppm CO2? Well, the biosphere was able to support much more large land life when it had higher CO2 levels. In fact, all this oil, coal, and gas we are burning was actually in the air at one time. Vegetation is the primary energy source for the food chain, and with the extra vegetation, animals used to really thrive. Things are a little tighter now. Speaking of polar bears: Polar Bears do just fine when the arctic is ice free. They have lived happily under such circumstances before, and their population is actually larger when the ice melts. Remember, the Arctic was navigable before the “little ice age”. Interestingly, the state of Alaska is suing the U.S. Dept. of the Interior for placing Polar Bears on the Endangered Species list. The polar bear population has quintupled since we began keeping track in 1960. Unfortunately, this is of no concern to those who would use the bears as a means to prevent development of land in the ANWR. I wish the politicians would come up with a more honest way to fight exploration in ANWR than by exploiting misinformation about the polar bears; but alas – they are politicians for a reason! Anyway, Mr. Small, I can see that we are indeed on the same side here. I think we are all concerned about the environment and proper use of our limited resources. I enjoy this site, and have learned a lot. I think you should stick around a while and see what kinds of zany things get brought to the light here, that you wont get on NBC. Also, it is good to be refreshed on how people are arguing in support of the global warming theories, and I appreciate your candor. They are still using the Polar Bears? Yikes! I assume that Cullen said more than this, I can’t see anything to object to in it. Will, what the board just doesn’t understand is how you actually believe that a tiny amount of gas which has a tiny IR absorption spectrum can some how control the temperature of the earth which is a bizillion times bigger. And you actually talk about a temperature of the earth as if there is one. Have you ever looked at time series and spatial array of the earths temperature and seen the variations with season and locale?. This would be a good place to start to try see what this is all about. Look up surface brightness RSS. do you have any idea what a tiny percentage of the earths daily temperature is deemed to have changed by the most alarming prognosticators? have you ever asked how much co2 is produced on earth, in the oceans and the skies, by man and beast and fish and algae and geology? Do you know what earths temperature should be? are we too hot or are we too cold? What is it within your soul that makes you believe that earth is being destroyed and makes you want to save earth, and have decided that doing so is so important that you dont ever examine your wished for effects or the apparent causes? Why do you think that you are so powerful that if you could only get THEM to believe and reduce the atmospheric co2 by 10 parts per million then the earth would be saved? Let me ask you a direct question: I will bet you that you do not know what an atom is, or even what an orbital is. And that you have never done an experiment and recorded data and tried to make an observable into a theory. To you “science” and technology was always something that you did not understand and you accepted the word of others , ” the scientists”, who are a priestly caste who knew things that you did not. You accepted what they said. You see the marvels all around you in cell phones and computers. Its a world you do not understand and could not reproduce. Yet from this world you latch onto an idea of saving the world and it invigorates you. One third of the US mercury emissions come from those coal plants! Reply: Will, you’re new around here, so you may not know it, but we don’t use the word “deniers,” or any of its permutations. Please use “skeptic,” meaning one who questions. Excuse me but ‘skepticism’ is not a synonym for ‘denial’, I’ll continue to use whichever one is appropriate and would suggest Will does likewise! REPLY: Ok Phil, let me make this easy for you. This blog is my home on the internet, you along with many others, are guests here, just as if I invited you into my living room for a chat. Now if one of my guests gets unruly, and says things that not only insults me, but the other guests, I see it as a reasonable to ask that person to refrain from doing so, and if they choose not to, ask them to leave my home. longer measure the “heat” (it’s lost in the noise). The impact? Very little if any. Rememder CO2 is a gas. All it can do is adjust to the incoming “heat” wave and it does it very quickly. CO2 is a lousy insulator. As far as I know, Hansen is still looking for the hot spot in the troposhere. No one’s getting unruly and insulting your guests (except of course your friends who have free rein to insult me without check). ‘Deny’ is not a word that’s associated with WWII Germany and is quite distinct from ‘skeptic’, and it’s not a word I’ve used to describe you or anyone else here but it’s not a word that I will stop using for a misguided sense of ‘political correctness’. As an example R John says: “Finally, does it actually feel warmer this year than any say twenty years ago? Our spring and winters are still starting and stopping on about the same time they always have. If we were truly warming, then you would see much longer growing seasons in the temperate zones.” Quite a definite assertion, hardly skeptical, just flies in the face of the data to the contrary, what would you term that Anthony? Hey, Phil., you should get over to climateaudit.org and try to defend Tom Karl and Ben Santer and his 16 als. That is a disgrace. And check out what Willis is doing to the Piltdown Mann. Your paradigm, that CO2=AGW, is foundering on the shoal of undetermined climate sensitivity to the feedback of water vapor. You shouldn’t indict yourself so easily and monstrously. Sensible people can understand the chilling arrogance of Heidi Cullen’s words. It is emblematic of your attitude that you find nothing wrong in those words. The mystery to me is how someone of your strong scientific analytic capability is a complete fool about the dearth of real empiric science behind the output of the climate models. Would you care to play with that bizarre skein? I am sorry but if somebody feels “scared” because the simplest problems in a given domain are too complicated for his referential of what “simple” should be , then he has a problem with this domain . Do you think that somebody would jump in a discussion about string theory with his conception of how “simple” it should be . Sure you could look at some computer runs and observe that their output doesn’t match data . At least not all the time , not everywhere at the same time and not all the data . This is indeed simple and needs no knowledge but it doesn’t begin to scratch the surface of the problem . Is it because the program has bugs ? Because the computer has not enough power ? Because the boundary conditions are not correct ? Because one or several parameters are wrong ? Because some approximations don’t always apply ? Because assumed constants are not constant ? Because parts of the physics itself are wrong or badly coded ? Etc . I will try to describe a problem that belongs for me to the top 3 climate problems in terms as simple as possible (a version of my previous post) . Everybody who tries to tackle this problem will get important and deep insights of what the climate physics is about . The GMT (global mean temperature) is considered as the main and most important metrics to make statements about climate dynamics . The “global warming” is supposed to manifest itself in GMT graphs , anomalies , statistics and such . OK , so now how is it computed ? Well you make a simple arithmetical spatial average of a finite number of points at the Earth’s surface . In its limit it is an integral over the Earth’s surface . Now as the laws of nature are local , expressed in terms of functions and their derivatives that depend on the coordinates – f(x,y,z,t) – the following question imposes itself . Has a spatial integral of a dynamical parameter (like temperature) which effectively eliminates the space by “averaging” a physical meaning ? Or in other words if I know the laws governing the temperature in San Francisco Golden Bridge , will the integral of all temperatures over California obey some set of “global laws” (deterministic or stochastical) ? Or must I , on the contrary compute all the temperatures all over California with the known laws FIRST and to compute the spatial average only AFTERWARDS in which case this average will be only an arbitrary number with no special relationship to the energy and the dynamics of the system ? Hint : look at the isotherms and their time evolution on a map . There is obviously spatial structure . Space averaging destroys the structure and the signal in it . What should we infer from that ? This is an extremely important , unsolved and not really “simple” problem . Suomen Metsäntutkimuslaitos (Finnish Forest Research Institute) is highly respected here in north, and their tree ring findings does not back up AGW at all. Instead it is all cyclical, and we have just seen +phase peak and temps are going down allready. Have fun with their great documents. You’re right, this exchange is giving us all an insight into how others think. You come on to this blog like Wyatt Earp intent on cleaning up Dodge City. Then it turns out you’re armed with nothing more than a peashooter. When you’re confronted with the fact that some skeptics have a more nuanced view of Climate Change than your usual talking-point blogs had led you to believe, you view that as “hedging”. If you’re just espousing a simple mindled Precautionary Principle, just say so and stop pretending it’s Science-based. The subject of global warming definitely makes headlines in the media and is a topic of much debate. I try to read up on the subject to have a better understanding, but it is complex. Often, it is so politicized and those on both sides don’t always appear to have their facts straight. History has taught us that weather patterns are cyclical and although we have noticed a warming pattern in recent time, I don’t know what generalizations can be made from this with the lack of long-term scientific data. That’s all I will say about this. The implication was certainly “toe the line or else”. “What is it within your soul that makes you believe that earth is being destroyed and makes you want to save earth, and have decided that doing so is so important that you dont ever examine your wished for effects or the apparent causes? Why do you think that you are so powerful that if you could only get THEM to believe and reduce the atmospheric co2 by 10 parts per million then the earth would be saved? I don’t think I ever insinuated that I was powerful enough to change the world or convince you to change your mind. I’m here to understand your mind. And it seems like folks are getting a kick out of understanding my mind as well. And yeah, I know what an atom is. I did go to HS. And you don’t need a PhD to be smart. I respect science & data. I don’t consider you guys to be a “priestly caste”. Otherwise, not sure what you’re getting at? Elaborate on the cell phone/computer thing. Yeah, it does seem magical doesn’t it? You know that 99.9% of the population can not give a cold answer to how these things technically work succinctly. And you may not be able to either if I walked up to you @ a cocktail party and said explain it in 60 secs. Why wouldn’t saving the world invigorate me? Doesn’t it invigorate you? Hasn’t a lot of progress (and regression) been made under similar thinking? Delusional or not. Why are you on this earth? To make it a better place I hope. That’s why i’m here, last I checked. Again, I’m an environmentalist. I like clean air and water and biodiversity and trees and polar bears, etc. And GW/AGW doesn’t seem to be a good thing for them. Look. Change is coming. The new admin will have an EPA that will begin to vigorously enforce existing regs that seek to minimize damage. It’s important for us to understand how we can bring you over to help us. Apparently, out data is insufficient to do so. So again, my challenge: what would it take to convince you that GW/AGW is real? What is the one absolute irrevocable fact that would convince you that we need to act to prevent total disaster? Since my followup, I haven’t seen anyone answer the question aside from my previous observation that there were a lot equivocating responses to the question. Please, somebody help me with an answer. You’re a smart bunch. Well the abstract is free and is very informative, I recommend the poster read it to disabuse himself of his misconceptions. Indeed I’m also not blessed with public funds (a subscription to Nature costs less than $4/week). Any member of the ‘general public’ can access it just like they can any magazine, there are these institutions called libraries too. Here’s another source for you (Figs 6 & 7), as far as I’m aware it’s free. Fig 3 is interesting too. Prove, without pre-programmed “models” that a doubling of CO2 results in a 2-5C increase in global temperature. It has already been long established that doubling of CO2 just by itself, in a laboratory experiment, resuslts in .6C. That is without any feedbacks. The IPCC contends that water vapor feedback will supply the rest of the warming, while ACTUAL OBXERVATIONS from the Aqua satellite show the increase in water vapor to be a NEGATIVE feedback, instead of positive like the models are programmed to show. Prove to me WITH ACTUAL SCIENTIFIC ATMOSPHERIC OBSERVATIONS that a doubling of CO2 leads to the positive feedback loop as indicated by the IPCC. 1.) I would have to be shown that the CO2 feedback loop theory was correct. The Aqua Satellite observations clearly indicate it is not. The middle and upper atmosphere are not becoming more humid. High-level clouds are not on the increase. Low level humidity is not causing positive feedhback, but to the contrary is forming low-lying clouds which increase albedo and create negative (not positive) feedback, and push us towards homeostasis. But the final verdict is not yet in. CO2 as a significant factor all hangs on that one question. Also, what MattN points out is important. We need to know more about the saturation level of CO2. 2.) Assuming that positive feedback is indeed happening, I suggest there are ways of addressing the problem other than cutting CO2 emissions, ways that are far cheaper, far more effective, ways that will not cost the huge number of lives that cutting CO2 emissions to the point of reducing world growth by a third or more would inevitably entail. Well, actual evidence not in the form of an assumption loaded climate model would go a long ways. Not evidence of warming, but evidence that it is abnormal. Less evasiveness on the part of the scaremonger community would also help. For instance, it would have been nice if Mann’s server, which held the data for the famous “Hockey Stick” did not have a subdirectory named “censored” which contained data that revived the MWP, which he disputed. It would have have been nice for Mann if subsequent evidence from field studies in Greenland did not undermine the case that the Vikings left due to “overgrazing” Overgrazing could easily be caused by the same number of animals and a shorter growing season. It would be nice if these kind of facts were pointed out, rather than obscured in published reports, creating skepticism. It would be nice if a declared interested party in the political debate, James Hansen, was not in charge of producing the data under discussion. That one would go a long way. Here is one question that no doomsday cult warmer like yourself ever answered for me, an answer to this might help convince me. If you could defend your answer in logical and mathematical terms, and not with rhetoric. I don’t think you can name one. I think you accept it on the authority of the UN and politicians you trust, and I think you accept it because of previous beliefs that capitalism is a bad thing and previous beliefs that corporations are evil. Not a singe “reason” I listed here could be considered evidence or the result of the excercise of logic. I am curious about one more thing from you doomsday culters. Do you know what the definition of “rhetoric” is? Rhetoric is a form of speech than sounds like logic, but isn’t. You can’t work out the behavior of physical systems accurately using rhetoric. The problem with arguing with somebody like Will Small is that he does not want to engage in the actual argument. I don’t know if he is just too stupid, or does not have the habits of mind that allow for critical thinking. He accepts what he is told by people he trusts. Then, for some reason I would love to know, after admitting that he knows little about the science, thinks he has the credibility to change a single mind. Even if we ignore the lack of tropospheric warming, the cooling of the oceans, and the lack of humidity increase, positive feedback is not happening at the moment, since CO2 is still merrily rising while temperatures are in stasis. Keenlyside et al have put the Pacific Decadal Oscillation in an IPCC model and foresee a stasis for the next ten years anyway. So whats the hurry, except for the sharks to make money fast before the ice age comes? I agree with you that even if greenhouse gases were a problem there are better ways of controlling them than by destroying the global economies and starving the third world. The albedo could be changed with that proposal of ships spewing sea water . shades put around the earth with a ring of satellites . I would favor the last because with clever engineering the same set up could be used to avoid an ice age, by reflecting judiciously extra sunlight, if it is an ice age that is in store as some are predicting by reading sun signs. It has already been long established that doubling of CO2 just by itself, in a laboratory experiment, resuslts in .6C. That is without any feedbacks. I’d be very interested in seeing that experiment, can you give a citation? Please tell me why glaciers are melting so fast, where the water goes, and how it impacts sea level? Based on my understanding from Al Gore and company, glaciers melting is a bad thing and harbinger of worse to come. canary and a coalmine sort of thing. Hey, I realize that’s simplistic but that should be pretty easy for you to eviscerate. Oh, and you had a few typos in your comments so don’t get down on me for a lack of ivory tower elite perfection. Why are you so patronizing, Moptop? And what kind of nickname is that anyway? Sure, let’s engage. Like I’ve said a few times that I was appalled by folks reaction here to the sacking of Dr. Cullen. That’s where myself and lots of morons like me try and get info from besides journals, the internets, & TeeVee. And I stated a few times my mission is not to change your mind. It’s to understand your mindset. And thanks for the questions on what you would like to see to convince you that GW is real. Especially MattN & evanjones. I plan to take these back to my camp and see what they might have in response. And then maybe I’ll bring them back over here to see how they play. But you guys are pretty rough with visitors. So maybe you can direct me to a skeptic place that engages more at my speed. Although, from what I’ve seen, they can be even nastier. talk about rhetoric. whew. Also, I know folks can’t take me seriously b/c of my lack of credentials. But I see some comments above that forecast economic doom if we clean up the Earth (cap & trade, etc.). Show me the data to support that theory. Because if the earth is destroyed, there is no greater economic calamity. There are alternate theories that this will have a net positive economic impact as green jobs are created. Just one example, Toyota makes hybrids which are very successful and Detroit has been unable to bring competition to the market on alternative vehicles. There are other areas where U.S. lags on research in wind, solar, geothermal, etc because of our fossil fuel mindset. American automaker jobs are getting ready to dwindle real fast along with that all of its support industry. I’m sure you’re familiar with that situation. And don’t blame the unions for Detroit’s demise. The point being lots of jobs are being lost because of the lack of vision in changing the way we do business. Phil, I’m sure you know that Svante Arrhenius derived that number a century ago. It is well understood and accepted. Will, in addition to the positive feedback proof, you are going to need to explain the 800-year CO2/Temperature lag better than the “just because it didn’t start the warming does not mean that it doesn’t contribute to it later” explaination I’ve read. In addition, you need to explain if CO2 induced warming shows up in the polar regions first, why is Antarctica refusing to warm up? You referred to ‘laboratory experiments’ not a derivation performed with a very imperfect knowledge of the spectroscopy of CO2 a century ago. I take it that your experiment doesn’t exist? Phil, my appologies. I cannot seem to find the reference I was remembering. I either mis-remembered, or simply read a typo that has since been changed. My bad. Sorry. In any event, the jist of my question remains the same. How does the IPCC get its value for doubling CO2 when the water vapor feedback is proving (with actual scientific observations from AQUA) to be negative? The “preindustial” level of CO2 captures 95% of the availible wavelength energy. There was never mre than only 5% rediational energy at that wavelength left to capture with additional CO2. Adding CO2 does… virtually nothing. Name me another industry that pays a high school graduate $85,000 to drive a forklift…. Care to explain how that negative feedback works? A load of nonsense written by someone who really doesn’t understand the subject I’m afraid, the comparison of the Earth and Mars spectra makes no sense, also the two graphs aren’t even in the same units. I strongly suspect water vapor feedback to be variable. What makes you think CO2 cap & trade will clean up the earth? Through the lapse rate. The lapse rate is not constant and is a function of absolute humidity. As humidity rises the lapse rate reduces. It needs only small changes in lapse rate to completely negate any doubling of CO2. The assumption of constant lapse rate is a fatal flaw in modelling. It is the reason we can still inhabit the tropics (despite the hypothesised spiralling warming via water vapour increases). And [snip], explain why we cannot compare the atmosphere of Mars and Earth in this way? And another thing Phil, Norm Kalmanovitch is a Canadian geophysicist with 35 years experience. What makes you qualified to say he does not understand the subject? Longer experience in physical chemistry, specifically in the area of spectroscopy, where his naive concept of saturation shows that he doesn’t have a good grounding in the subject. Also he completely ignores the vastly lower atmospheric pressure on Mars (less than 1% of Earth’s) and the effect on pressure broadening and hence absorption. The analysis of the two absorption curves is way more complicated than saying that they look the same! I don’t know who “phil.dot” is, but if he’s the same guy posting at Climate Audit (and based on other comments by him on this site), he seems pretty qualified to talk about climate science. I don’t mind tweaking him myself, but don’t assume he’s some AGW’er who just wandered in off the street. Through the lapse rate. The lapse rate is not constant and is a function of absolute humidity. As humidity rises the lapse rate reduces. It needs only small changes in lapse rate to completely negate any doubling of CO2. How does the change in lapse rate negate the effect of CO2 increase? Just a quick note. Heidi Cullen is still working, full time as I understand, at the Climate Central, a non-profit organization based in Princeton, NJ. I think she will be fine, and it is likely that she will have the opportunity to express her opinions more freely by being in such an organization without any commercial obligations. Just a quick note. Heidi Cullen is still working, full time as I understand, at the Climate Central, a non-profit organization based in Princeton, NJ. A position she took up in January, she has not hosted ‘Forecast earth’ for quite some time (just makes guest appearances). And that really is the problem, isnt it John? Phil.dot, Eli Rabbet, Tamino and their ilk hide behind annonymous webnames. Who are you? What have you published? Why should I listen to you? Can you prove it! Anthony Watts, Steve McIntyte, Joe D’Aleo, John Christy/et al have NO PROBLEM posting as themselves and supplying thier credentials. Which is why I listen to them. They aren’t hiding. So Phil.dot. Who are you and why should I listen to you? REPLY: John M who are you and why should I listen to you? For that matter why should I listen to anyone too timid to use their name? This is why I encourage people to stop hiding behind monikers and post with your real name. My view is that anonymous opinion, no matter how factual, rational, or relevant, (to borrow a famous phrase) “isn’t worth a bucket of warm spit”. I was just remarking on “MattN” complaining about someone being anonymous. REPLY: I know you were, but I’m just trying to make a point too. Anonymity counts for zilch. Anonymous arguments are sub-zilch. Just one more and I’ll quit, as I respect your opinion and this is your blog. But what does it matter if an anonymous commenter posts a traceable fact or poses a cogent question? Facts and ideas speak for themselves, and have no names. I understand your sensitivity, however, as you have been personally attacked by anonymous bloggers. REPLY: It is about credibility. With so many ideas and opinions being posted, it is often difficult to sort our truth from fiction. A name that you put to any idea or opinion says that you stand behind it. To me it is a distinction of importance. Questions evaporate when answered, facts can be checked, and anonymous contributions don’t matter much there. But when someone puts forth an idea, such as Bill Illis does, with the full weight of his name behind it, it is automatically up a notch on the respect meter. An astute observation on your part and succinctly put. I prefer to be known for where I stand. Hence I use my real name. I’m not going to judge anyone else for what they call themselves, as long as it’s consistent so that I can get a sense of who is speaking. IMHO It’s indicative of the diminishment of respect for free speech. If I used my whole name it would be obvious I’m a dog. In this field, where there is such a polarization of true believers and heretics, if there were no anonymity many people would not take part because of real fears of job security. There are other reasons people might have for not in appearing full name. The blog would be much poorer in that case, in my opinion. I agree that new proposals and work cannot be taken seriously unless anonymity is lifted. The internet has given an extra dimension to scientific discourse, though : It used to be that a work would be sent in at least to a workshop or conference, to get a discussion on its merits. Often it was just sent in for publication and the response would possibly be another publication. Now it is as if one has telepathy and can hear the thoughts of all the readers of the publication . If telepathy existed we would not know the real life identity of the speakers, just the thoughts. This is something like that, an extra dimension. I am learning about AGW. As a learning tool I visit here and other sites. At this point I’m leaning towards AGW not being real. However I do feel GW is real, but we may just be in a warming cycle. Time will tell. I need to see temps FALL over a long period of time not just slow their rate of rise which is what I see from looking at all the temp charts…..The beauty of the non-AGW side is they just have to prove the earth isnt warming or even easier that if it is warming its not caused by man. Unfortunately if their side is right, it may be proven after many political changes have been made. This means harm may come. Anyways, I have been impressed with the Coaches comments especially towards Mr. Small. I thought some of you were way too quick to jump on Mr. Small. That in turn made him go into a natural human defensive mode and come back with some anger. That almost started a vicious cycle of more harsh posts. Luckily the Coach made some great comments. Now back on topic. I am soooo glad Forecast Earth is off the air! I have a feeling that this doesnt mean TWC has dropped its AGW viewpoint since GE is clearly a proponent of it. I think we will see it on TWC in another form once the financial crisis is over. In fact I think TWC will be even more Green in the not too far future. I have already tenure, because I am retired. I also do not mind speaking up eponymously in my part of the globe ( Greece) against the CO2 stampede for global warming. These forums though have a large readership and I happen to have a relative advancing in an international scientific field where one of the head people ( whom I know) has come all out for global warming a few years ago. I am just being a bit cautious for that reason. Greek is all greek to the powers that be, but english is different :). It jut kills me to read that people who are skeptical about AGW feel compelled to post “eponymously” (a term I am well familiar with, having intensely studied Greek myth) because to do otherwise may threaten their careers or the careers of those near and dear to them. you mean “forced to post anonymously”, no? Well, one does hear stories. The whole field has become so politicized, is so much dependent on feeding from the public funds that anything can be expected. I would suppose the same would hold true for an AGW working in a den of skeptics, no? Hmmm, Eponymanonimondas. Perhaps she lays it out in the land of Epamindondas. Anthony: REPLY: It is about credibility. With so many ideas and opinions being posted, it is often difficult to sort our truth from fiction. A name that you put to any idea or opinion says that you stand behind it. To me it is a distinction of importance. Questions evaporate when answered, facts can be checked, and anonymous contributions don’t matter much there. But when someone puts forth an idea, such as Bill Illis does, with the full weight of his name behind it, it is automatically up a notch on the respect meter. I am in a position where I can have tremendous infuence on our future scientists. It is my life, and I am very passionate about it. I had a co-worker dismissed last year because of these politics. It was an absurd situation, of course, and eye-opening. I agree with every point you made, but it is more important for me to stay in a position where I can help my constituents educate themselves about these matters than to add more weight to my discussions on these boards. Yes, it is hypocritical. I am even a member of a union of which I both pay dues and disagree with almost every decision they make. Yet, the alternative is not having any protection or security. Yes, I am a coward. But, I have a much bigger influence by working on the “inside” than I would in a new line of work. Sorry, Phildot, but I’m not interested in your posts unless you show at least alittle courage & reveal your real name. In my opinion (and from what I have seen) tenure doesn’t require one to have any specific opinions, but it depends on how they express those opinions. If a AGW skeptic publish (and this is the requirement) enough AGW skeptical papers in respected journals, he/she will get tenure if other requirements (namely teaching and service) are satisfactory. But if one gets carried away posting rude articles by calling others names, then tenure is going to be a problem. But such characteristics are going to be a problem even after tenure – academic people review each other and get reviewed by each other all the time, for promotion, proposals and papers, etc. One cannot afford to be disrespectful to others and other opinions at anytime. From what I understand people like Lubos Motl and Mike Adams got into alleged troubles not because of what they said, but how they said it. In my view anonymity does not really diminish the value of an opinion (I think we should judge the opinion by its merit, not because who said it). But anonymity certainly promotes disrespectful behavior in blogs. Ben as I explained above, but Anthony saw fit to erase, the reason for not putting my full name is that in the past I have been subjected to spam attacks which significantly disrupted communications between me and my students and colleagues. Everything I post on the science can be verified in the scientific literature. Sounds like an ideal world. 35 years of observing how scientific decisions were made in my discipline ( particle physics) do not bear this out. I have seen mediocre people pushed into professorships because of “connections”: who knows you and whom you know. There are fads and fashions in science, people can be “in” and “out”. This influences many decisions including tenure or the offering of a job. Now in addition, when most scientific publications are cornered by AGW reviewers, is it realistic to expect peer reviewed skeptic articles to go through? They are often summarily refused. It is pitiful to read papers which have little to do with global warming that have a small sentence appended, a bow to global warming. I guess it is in the same ball park as anonymity here, better safe than sorry. anna v is right. John McLondon is mistaken. Recall the recent situation where Viscount Monckton could not find any climate related journals willing to publish his work, so he was forced to resort to publishing in the acs.org journal. The editors and referees of many climate related journals are part of gaming of the system by playing favorites. They deliberately and unethically keep skeptical submissions out. On the other hand, submissions by those with a pro-AGW point of view are very often accepted uncritically — to the point that they accept fraudulent submissions. As the Wegman Report to Congress makes clear, there is a clique of pro-AGW people who review each others’ papers uncritically. And this same clique colludes in keeping out skeptical papers. The peer review system in the climate sciences has been largely corrupted. Read Prof. Richard Lindzen’s recent paper to understand how bad the situation has become. Climate science publication and peer review is now at the level of the Ward Churchill debacle, in which Churchill was hired and given tenure simultaneously, not for his accomplishments, but for his political views. Of course, I will not deny the effect of connections and friendships. One has to get so many external reference letters for tenure and if the others are comfortable with the candidate then they will take the time to write a stronger letter. It is just natural. On the other hand, if reviewers feel like this person is highly opinionated and rude, they may not want to write letters for him/her. But I do not believe that in order to get that letter the candidate has to be in agreement with all the reviewers about scientific matters, he/she just has to be able to cultivate a positive relationship with them even while disagreeing with them, but when we disagree we need to do so with the proper scientific tools and arguments. This is done all the time, and can be done without much trouble. On AGW believers being the dominant group of reviewers, well, that is a reality. Most climate scientists (and most members of the National Academy) subscribe to AGW. In order to counter the generally accepted AGW theory, one has to offer very strong reasons to show that AGW is wrong. That is a fair scientific standard. For example if one wants to show that cold fusion works, then they better be prepared to give extremely good evidence, since they are going against the currently accepted scientific norm. The requirement is more demanding if one wants to challenge any of the accepted items in science. But there are plenty of examples from history where scientists had met such high standard to overturn an accepted theory, while working in universities. AGW is not different. In addition, there are couple of other issues. It is very rare for someone to write a paper to conclude that AGW is wrong, scientific papers are directed at more specific smaller aspects, one of the thousands of aspects involved in the general climate science. Conclusions on such smaller aspects are less contested compared to the larger conclusion on AGW. In addition, we know that Lindzen, Spencer, Christy, etc. all publish in respected journals, not all of them are supportive of AGW, which shows clearly that given sufficient reasons, papers written by known skeptics are still going to make it through the review. Smokey, Thanks for Lindzen’s link. We may speculate endlessly about the merits of “Forecast Earth” but as a former presidential candidate once said “Its the economy stupid”. With advertising revenue forecast to decline 7% next year and with cable diluting the audience for existing outlets, the contractioin in the media is just getting started.